The 40-hour Level 1 training offers yoga teachers a comprehensive course in how to teach prenatal yoga to all pregnant women. This training includes ample hands-on experience. In the first half of the course, participants will observe Barrett teaching prenatal classes. In the second half of the course, participants will teach students themselves, and receive feedback and guidance. In addition, participants receive a comprehensive manual and access to audio podcasts and prenatal picture sequences. Completion of a 200-hr. or greater teacher training, and/or current regular yoga teaching. There will be a break for lunch each day. A detailed schedule will be given to registered participants. $750 (early registration $675 if paid in full one month prior). Registration must be received no later than one week before training in order to complete the required reading (about 3-4 hours worth of reading). Additional discounts: If you register for both Level 1 and Level 2 at the same time, total cost is $1300. That’s $200 off the full price of both trainings. You must register one month in advance of the Level 1 training for this discount. for any of the above trainings! Five Points Yoga, and Barrett Lauck Reinhorn, are registered with the Yoga Alliance as a Prenatal Yoga School. 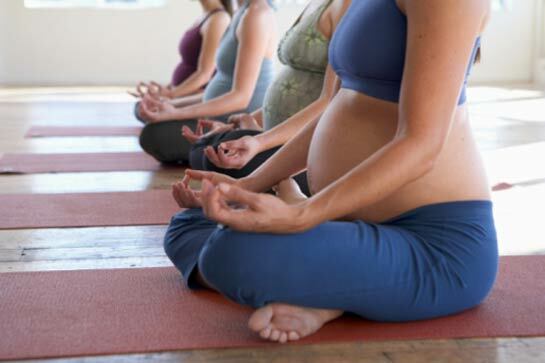 Level 1 is a basic training that will equip you to teach outstanding prenatal yoga classes. Level 2 is an advanced training, only for those who have completed Level 1, and is designed to take your teaching and understanding of prenatal yoga to a superior level. At the completion of both levels of training, you will receive a certificate of completion. The two trainings together make any Yoga Alliance Registered teacher (200-hour or more) eligible for prenatal registration with the Yoga Alliance (Yoga Alliance requires 75 contact hours of training for prenatal yoga registration). Refunds more than 30 days in advance subject to a $75 processing feel. There are no refunds less than 30 days in advance.